The $500M allocated for Homestretch Development Inc in budget 2017 to pay off its $798M debt to contractors for the D’Urban Park Development Project is all government will be providing, said Finance Minister Winston Jordan. “I think the money that is owed (by HDI- the company which built the D’Urban Park) is roughly $798M,” Jordan confirmed to a news conference this morning at the Finance Ministry’s boardroom. “The government indicated that it can only accomodate $500M as a full and final settlement, so what that means is that HDI would have to make some apportionment relative to the debts owed,” the Finance Minister continued. Public Infrastructure Minister David Patterson told the National Assembly in the Committee of Supply recently that HDI had met with the Finance Ministry days before the 2017 budget, and it was agreed that some $500M, which will be transferred directly to the company, will be allocated to pay off the company’s debts to creditors. 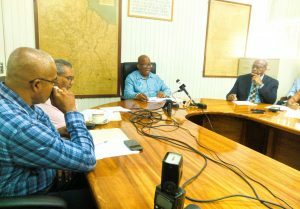 When asked how suing the company would work out since government has declared special interest in the company, even placing Education Minister Dr Rupert Roopnaraine on the company’s board, Minister Jordan dodged the question saying he could only answer questions relating to the debt total for HDI and how much was provided. “I don’t want to answer any more questions on this,” Minister Jordan said shutting down further questioning on the controversial D’Urban Park matter.